"Douglas Lawley was [a] teacher remembered with pride by those in his class. His subject was Latin, but he also supervised the art class and was himself a versatile and competent artist. His paintings of horses, from the sleigh cab horses on Mount Royal to the wild horses of Sable Island, were particularly fine and extremely popular. Several of his canvases now hang in the high school principal's office." Westmount High School (westmount.org). Douglas Lawley was born in Glace Bay, Nova Scotia in 1906. He graduated from Mount Allison University and then McGill University in Montreal. As early as 1937, Lawley had considered becoming an artist but teaching won out as his primary occupation. He taught for many years, specializing in Latin. Later in his career, Lawley became principal of Westmount High School. After his retirement one of his former students, who had become a teacher at Montreal's Lower Canada College, convinced Lawley to resume teaching and take up a position at the College. Lawley pursued his interest in painting as a student of Agnes Lefort in Montreal and Aldro Hibbard of the American National Academy. Although we know of a body of harbor scenes with fishing boats painted in Nova Scotia, the most significant, exciting and original of his oeuvre are his paintings of horses. While home in Montreal, he painted delightful scenes of the summit of Mount Royal, often featuring the horse-drawn caleches touring about. Sketching in the Charlevoix area, Lawley observed teams of horses being used to log the area. While back in his native Nova Scotia, Lawley was told of Sable Island, an island off the coast where, according to legend, there existed some wild ponies, which had been abandoned there in the 16th century* after an attempt to settle the island. Even in Lawley's day, before oil companies took an interest in the area, Sable Island was still a sanctuary for the ponies, access being controlled by the Federal Department of Fisheries. Lawley visited Sable Island a few times and found there his most important subject matter, these magnificent Sable Island ponies which, over the years, had developed very thick hides to protect them from the fierce wind and storms of the area. Paintings of these ponies were featured in Lawley's first solo exhibition held at the Dominion Gallery in 1962. 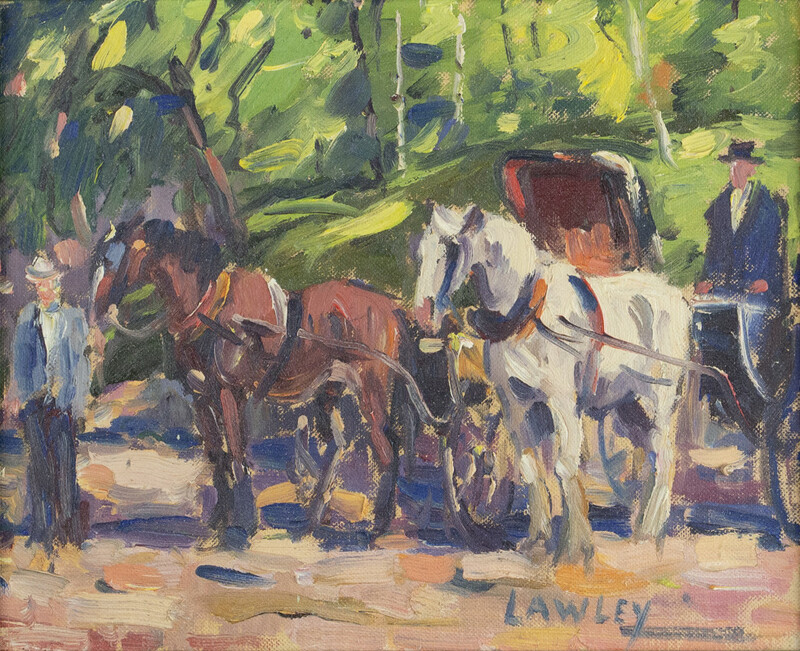 Since that time interest and enthusiasm for paintings by Lawley has grown enormously, particularly in the province of Quebec and throughout the Maritimes. Douglas Lawley's paintings are represented in numerous private and corporate collections throughout Canada. * This was inaccurate, however. In reality, the ponies were introduced in the early 19th century.